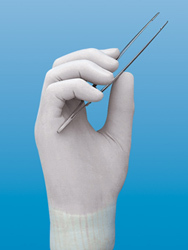 The Protegrity® powder-free latex surgical gloves redefine barrier protection. This innovative glove provides triple-layer protection. The outer layer is natural rubber latex, the middle layer is a latex/nitrile (nonlatex) blend and the inner coating is 100% nitrile (nonlatex). Gloves contain 50 micrograms or less of total water-extractable protein per gram and pass the Intracutaneous Reactivity Test for dermal reactions. Gloves have 12" average length and 9.4- mil average finger thickness. Supplied in easy-to-store pack.